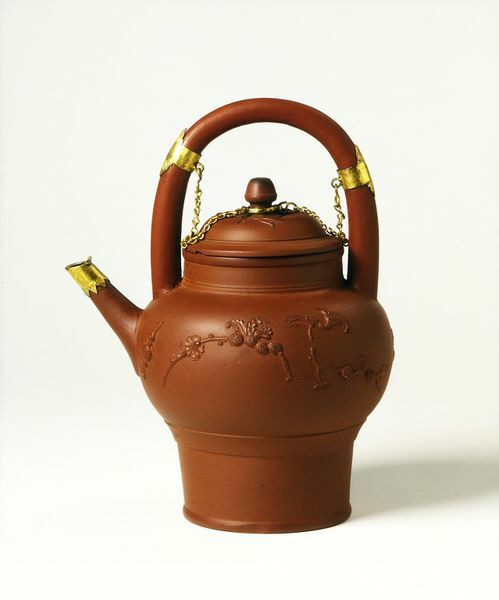 This teapot appears to be unique, although another example of the body shape is known, with a normal loop handle at the back. 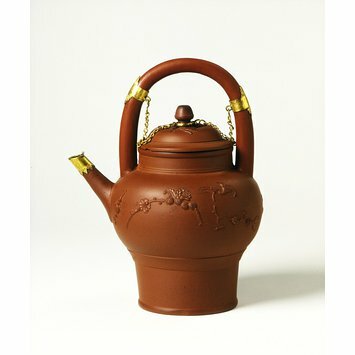 The overhead 'bucket' handle was common on Chinese porcelain or enamel teapots from Canton (Guangzhou province), but is not known on the red stonewares from Yixing (Jiangsu province). Here it may have been copied by the Elers brothers from a European engraving of Chinese teawares rather than from an actual Chinese teapot. The Dutch brothers David and John Philip Elers, though now seen as pioneers in ceramic development, at the time made very little impression on the potters of Staffordshire. This was due partly to their pottery being at Newcastle under Lyme, some distance from the main pottery centre of Burslem, and partly to the secrecy with which they conducted their experiments and their production. The very high price of their products and their subsequent bankruptcy was not considered an example to follow. Red stoneware could only be made from suitable clay rich in iron, a seam of which the Elers found in Staffordshire. Even John Dwight, the founder of the Fulham Pottery who had patented manufacture of the material in 1684, obtained his supplies from the same area. Where the Elers brothers failed was in using the uneconomical slip-casting technique, known to them from their silversmithing trade, for everything, including plain round forms. Passion for Porcelain: masterpieces of ceramics from the British Museum and the Victoria and Albert Museum.